Here’s a fascinating disc filled with a cornucopia of instrumental colours and artistic styles. Hearing standard repertoire redressed with different textures and hues largely reminds listeners as to just how universal the music and message was; discovering less-known work in its original clothes adds yet another dimension to the serious music lover’s palette. Timescape will make a welcome addition to collections everywhere. 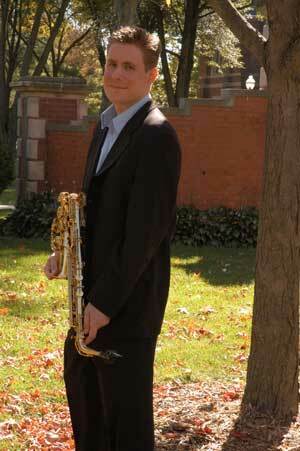 The mastermind of the ambitious project is saxophonist extraordinaire, Dave Camwell. His soprano sax artistry is superb—particularly the extreme upper register which contributes significantly to the sonic success of Steve Reich’s New York Counterpoint (originally commissioned for Richard Stoltzman for clarinet and tape; another version has 11 clarinets—8 clarinets, clarinet /bass clarinet, 2 bass clarinets) is more about literally playing off one another than contrapuntal lines. Sara Sipes has done a masterful job of reworking the mesmerizing soundscape for saxophones. On the alto saxophone, Camwell’s phrasing and breath control (or deliberate breathiness on occasion) are a pleasure with only a slight concern about too much tongue engaging the reed, making razor-sharp attacks with his colleagues a nickel short of perfection. Bach’s Concerto for oboe and violin begins the chronologically ordered CD where Camwell shares the solo honours with oboist Jillian Camwell. This family affair is a marvel of “as-one” music making where the busy or thoughtful lines are shared with remarkable honesty and verve for the art. For these ears, the outer movements seem too fast to let them ever truly settle; the “Largo” is lovingly crafted yet Ron Albrecht’s piano (as in all of the movements in BWV 1060) is too present to ideally balance the protagonists while cellist Mary Pshonik is the model of bass line discretion. Given the original’s numerous Haydn-horn double stops and ethereal harmonics, including Paganini’s Op.1, IX (“The Hunt”) on the menu seemed risky, but through the magic of recording technology, Camwell pulls it off—especially the bravura-laden second section—and he makes his case in nearly the identical time (two-seconds longer) as Midori’s 1989 version. The last of the “classics” is a very satisfying redo of Poulenc’s Trio for oboe, bassoon and piano. Pianist Christy Eckerty’s first appearance immediately establishes her credentials, instinctively knowing when to lead or support and follow. The engagingly playful “Rondo”—where all scamper about with unabashed joy and considerable skill—is the highlight of an all-together satisfying performance. After the Reich transcription, the music shifts to the realm of original orchestration. As good as the previous tracks were, the final three pieces have more to savour, rendered as they are in their first-imagined skins. With Jillian Camwell now playing English horn and Eckerty once again at the keyboard, Michael Touchi’s Tango Barroco captivates the ear from red rose stem to stern. “Slowly and very free/Fast,” following a dark, somewhat mysterious opening, slips into easygoing jazz as Camwell (soprano sax) finds the groove immediately and never falters. The short cadenza (English horn) is the perfect foil to “Now it’s my turn” as the double reed gets all toes a tappin’. Touchi’s nod back to Beethoven’s era is as fun as it is unexpected. Eckerty deftly lays down the more traditional tango in the middle movement before the Camwells beautifully intertwine their haunting lines. The music teeters on the edge of melodrama with the cliché harmonic shifts and suspension-rich cadences; the faster contrasting sections—with even a couple of scales tossed into the mix—are a welcome tonic. Echoes of the style and structure of the opening Bach concerto abound in the finale: any doubt as to where the “Barroco” comes from is convincingly settled once and for all. Farfalle Cotte, (a 65-second Perpetuum mobile for two “same treble instruments”—in this case soprano saxophones: James Romain joining Camwell, expertly blending in with the flash, fire and fun), flits about as only two matched “butterflies” can, proving yet again that less can often be more. Russell Peterson’s Trio for flute, alto saxophone and piano is, in many ways, “best for last.” Flautist Kim Helton moves hand-in-hand with Camwell while Albrecht (and the recording team) has found just the right level to balance his colleagues. The “Andante/Moderato” has a curious aura of Americana but never lacks clear, forward direction. The piano opens the second movement, darkly “tolling for thee” and is magically answered by the winds in a cavern, at times with prayer-like tone. Albrecht adroitly shifts into the jazzier middle section, readily setting up the flute-sax riffs that positively savour the top of their respective ranges. After the tolls return—calming everything down—there is nothing left to do but fade away al niente.